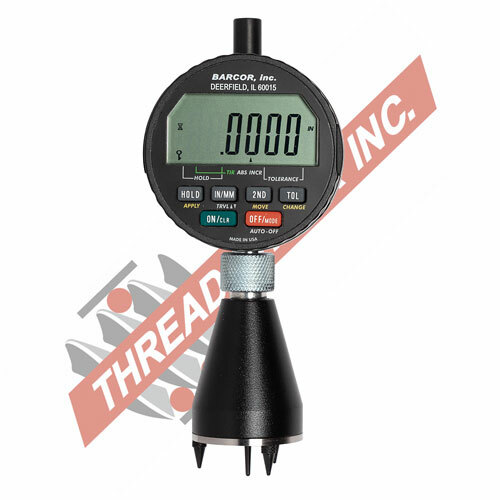 Thread Check Inc. offers a complete range of Chamfer Gages, Countersink Gages, Rivet Gages, and Hole Gages from Barcor Inc. Barcor gages are economically priced and simple to use. Barcor Inc. has a proven track record of offering precision gages that are accurate and repeatable. All Barcor gages are made in the USA and unconditionally guaranteed. Contact Thread Check’s expert sales engineer. 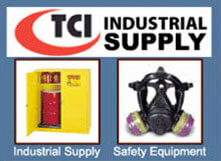 Thread Check Inc. offers more than 320 standard Barcor models. The BARCOR CHAMFER GAGE is a precision instrument designed specifically to measure the top (major) diameter of a chamfer, countersink, center drill, or tapered hole. Merely press the spring loaded, conically ground, precision 3-blade Gaging Plunger into the chamfer or countersink and instantly read the dial in .001" or .01mm/.02mm diameter increments. 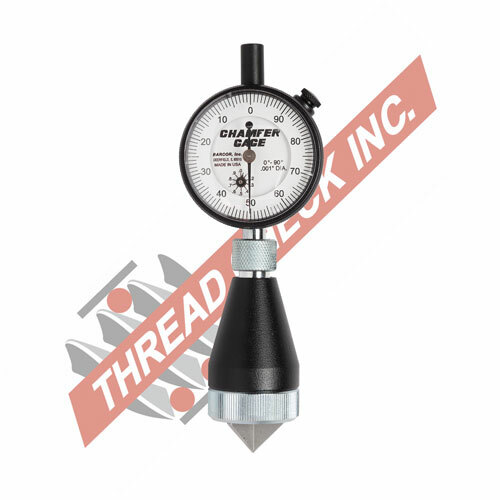 The CHAMFER GAGE is a direct reading gage. No Setting, Master (Standard) or look-up chart is required. To "Zero" the gage or check the setting, press the base of the gage against any flat ground surface and adjust the dial to read the "Set To" number stamped on the back. The CHAMFER GAGE is available in two angular ranges: 0°-90° for angles of 90° or less, and 90° - 127° for angles greater than 90° but less than 127° Models for angles larger than 127° are quoted on request. The standard BARCOR CHAMFER GAGE is furnished with a hardened Tool Steel Gaging Plunger. Optional Solid Carbide Gaging Plungers with a LIFETIME wear guarantee are also offered. 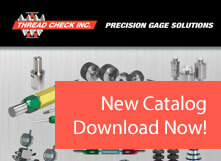 Other options include .0001" reading Super CHAMFER GAGE, External Models, Micrometer Models, and HALF SIZE Models. Countersink Gage: The BARCOR COUNTERSINK GAGE is a precision instrument designed specifically to measure the top (major) countersink diameter. Merely press the spring loaded, exact angle Gaging Plunger into the countersink and read the countersink measurement directly. 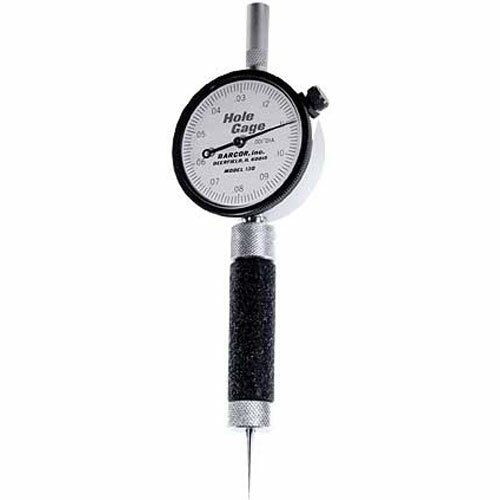 RIVET GAGE: Control Rivet Height/Flushness/Depth directly in .001" or .0005" or Metric equivalent. HOLE GAGE: 2 Models (11 English/11 Metric) cover a range capacity from .010"(.25mm) to 1.030" (26.20mm). 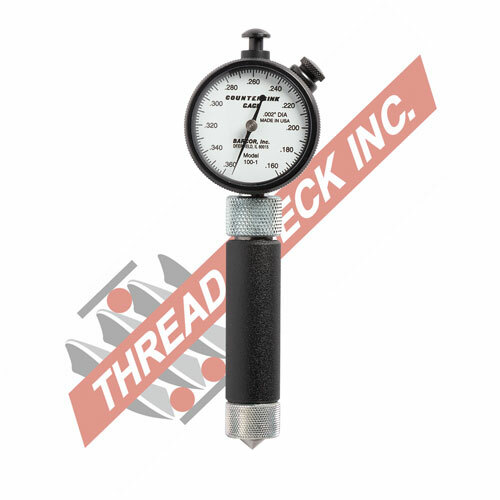 For more information, to receive a quote, or to place an order, please contact Thread Check’s expert sales engineers at info@threadcheck.com or call (800) 767-7633.